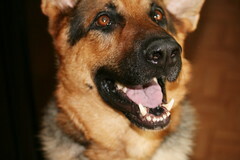 The is Chopper Amadeus, the German Shepherd my sister recently adopted from Kentucky. Needless to say, I am tickled pink to have a new dog in the family to use as a model. He certainly is a handsome fellow and is happy to have a new home!